The Downtown Ithaca Alliance offers internship, work-study and volunteer opportunities to students for both one-time projects and extended periods. You got the call for an interview, but now what? Stefany Fattor, the School of Business internship program director, shares some essential tips sure to make you stand out from the rest of the pack. Some of the best internships can be found by doing research and looking for opportunities in non-traditional places, including classified ads, alumni online communities, and the Yellow Pages. Other good resources are the Office of Career Services and your school’s internship coordinator. Networking is the art of making connections. From the moment you arrive at IC, you should be reaching out to alumni and other professionals for advice and information. Maintain those relationships so that when it becomes time to find an internship, you have a strong network of people to approach. A great resumé and cover letter do not get you an internship. They get you an interview. So don’t send the same resumé and cover letter to all potential employers. Tailor your cover letter and resumé to the company to which you are applying. The job description of the position you are applying for and the company values you learned while researching the position should dictate what you highlight. Know as much about the company as possible before you go to the interview. Find out as much as you can about what it takes to succeed in that company so you can prove you have those traits. Make sure your answers are concise and give specific examples of your successes. See what internships await you at IC! Great experiences can be anywhere: Many students are drawn to big cities when it comes to internships, but it’s not necessary to travel far and wide to do something worthwhile for your future. 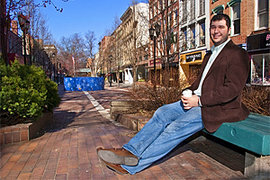 John O’Hara ’09 learned that last fall while interning with the Downtown Ithaca Alliance (DIA). The DIA is a nonprofit organization that serves as a liaison between the businesses in downtown Ithaca, and strives to revitalize and develop downtown. Through the work of the DIA, businesses in Ithaca come together to put on events for the Ithaca community, such as the Apple Harvest Festival (a.k.a. Applefest), the Chili Cook-off, and the Holiday Parade of Ice. These well-known events, attended by members of the Ithaca community and IC students alike, take a lot of hard work and preparation, which O’Hara learned firsthand. O’Hara is a business administration major with a management concentration and minor in legal studies. Originally hired as the retail operations intern, he became the events and marketing intern when the sponsor left. Although this position didn’t exactly match his field of study, O’Hara quickly realized that management carries over into events and marketing. “I saw how a lot of management techniques I learned in class apply to the behind-the-scenes work,” O’Hara explains. Although his official title carried the word “intern,” O’Hara was treated as anything but. His job responsibilities paralleled those of his manager, Vicki Taylor, the events and marketing director, and he maintained a great deal of independence on the job. He enjoyed the balance between office duties and working with clients face-to-face, and he quickly learned that people skills, energy, and a good personality are a must when working in events planning. O’Hara started his internship just prior to the DIA’s biggest event of the season, Applefest, held in late September. He was thrown right into the crucial planning and execution stages of the event, discovering that there’s much more than meets the eye to these productions. “You have to work with the local government, New York State officials, and all the vendors, making sure everything is by the books and meets specific codes,” he explains. For example, Applefest brings thousands of people and dozens of vendors to the Ithaca Commons for one weekend. Only O’Hara and Taylor were in charge of these vendors. Details such as tabling proximity and location of vendors on the street had to be configured to the inch. Many of O’Hara’s responsibilities involved communication with other businesses and marketing the DIA. He served as the face of the DIA, speaking with vendors, cold-calling, and soliciting feedback at events. O’Hara was also put in charge of a downtown Ithaca gift cards proposal, putting more of his business knowledge to work. His favorite part of the whole experience, however, was the actual events. “Seeing the culmination of all your work, seeing it all happen, it’s a rewarding feeling,” he says with pride. This internship was O’Hara’s second. Last summer, he worked as a management trainee at Enterprise Rent-A-Car in Norwood, Massachusetts. From working with insurance companies, contracts, and doing credit checks, to working the front line, and even washing cars, O’Hara kept the customers happy and business operations running smoothly. The company’s slogan “Enterprise will pick you up,” was a standard that O’Hara experienced himself. “Many times I would take the car right to the customer.” On one occasion, he got to go into the New England Patriots locker room to bring a player a car. Another time he brought a car to singer Kenny Chesney’s bus driver and got a tour of the bus. “I realized how important service and trust are in companies. People paid for our good service, and some people would drive an hour just to deal with our branch,” he says. O’Hara took this to heart and made lasting impressions with many customers. His name was mentioned twice in a quality survey distributed to customers, and he now has a great networking opportunity within the company. “The greatest thing about these internships is experiencing the intangible things you don’t learn in class,” he says. Whether it’s working with a large corporation or a small partnership, there truly is no better preparation than hands-on experience.